These operators are currently under pressure due to investment in emerging technologies, including 5G and M2M networks. Thus, they must develop and deploy new capabilities that can leverage their networks to both increase revenues from voice services and reduce OPEX (Operational Expenditure). 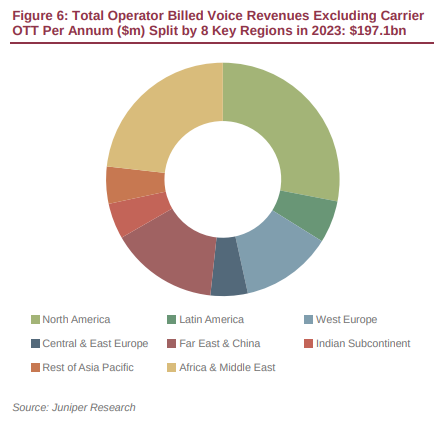 That said, the latest worldwide market study from Juniper Research has found that operator-billed mobile voice revenues will fall from $354 billion in 2018 to $197 billion by 2023 -- that's an average annual decline of 10 percent. The new research, Mobile Voice: Operator Strategies & Vendor Opportunities 2018-2023, identified a series of new opportunities which collectively would enable mobile network operators to sustain, or even increase service revenues. Juniper identified 5G as critical for operators to slow declining voice revenues. It is expected that 5G connections will exceed 370 million by 2023; generating $88 billion in operator-billed revenues. This will be over 50 percent of the anticipated voice revenue loss. It also argued that operators could generate additional revenue through support for new voice services; powered by technologies such as Google’s Duplex. In order to capitalize on revenue streams for emerging voice services, Juniper advises that mobile network operators must adopt new ecosystems of converged technologies -- including voice, messaging and digital assistants. It predicted that operators will facilitate this by supporting the CPaaS model, whereby central management of communication is offered via a single platform. The analyst forecasts significant growth for OTT software apps, such as WhatsApp and Facebook Messenger. These apps will generate 15.7 trillion minutes of voice usage by 2023; equivalent to streaming 3.8 trillion music tracks. In response, Juniper urged operators to rollout voice technologies that offer superior benefits and are easily integrated into this CPaaS approach, such as VoLTE (Voice over LTE). "The OTT ecosystem is fragmented and, as a result, is unable to offer the same level of reach as mobile network operators. In order to maximize OTTs shortfall in this area, operators must adopt the CPaaS approach to win back traffic, thus minimizing future shortfall in revenues," said Sam Barker, senior analyst at Juniper Research. Moreover, Juniper forecasts that VoLTE users will exceed the OTT voice app users for the first time in 2020, a year earlier than they had previously anticipated.